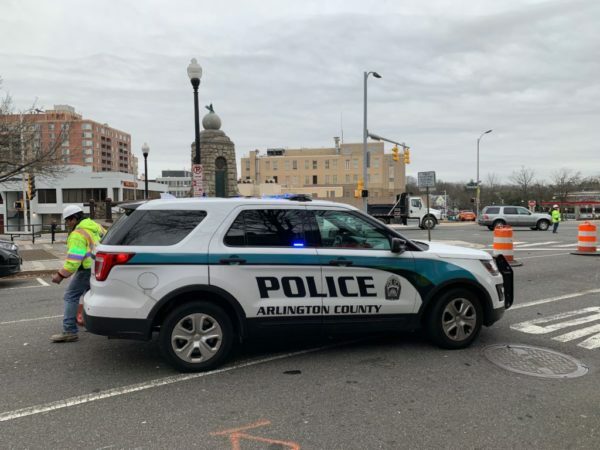 Arlington County Police this week launched the 2019 version of the regional spring “Street Smart” safety campaign. 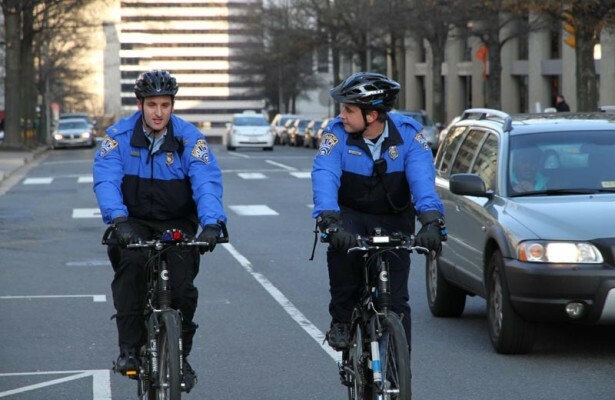 Two “high-visibility traffic enforcement” events are planned — one from 4-6 p.m. next Friday (April 26) along the 3200 block of Washington Blvd, near Clarendon, and another from 7-9 a.m. on Tuesday, May 7 on the 3100 block of Clarendon Blvd, next to the Clarendon Metro station. Spring is here, and more people are taking advantage of the warmer weather by walking, biking and operating shared mobility devices. 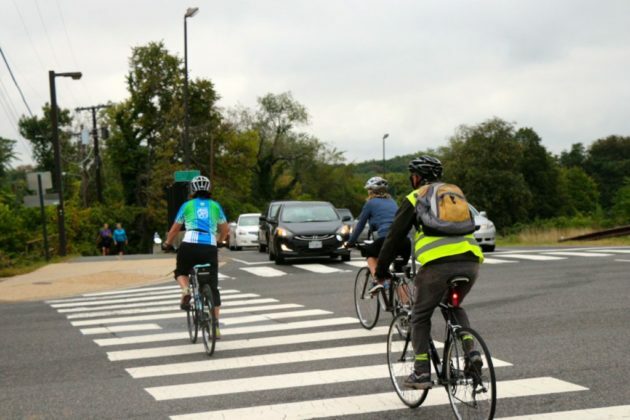 To ensure all travelers safely share our roadways, law enforcement throughout the region will participate in the Metropolitan Washington Council of Governments’ Spring Street Smart campaign from April 15 – May 10. The campaign aims to reduce the number of traffic related crashes and injuries on our roadways by identifying and changing unsafe behavior patterns among travelers. Capital Bikeshare is currently removing electric bikes after concerns about the brakes. Several D.C. riders shared experiences on social media of CaBi’s strong brakes causing their e-bikes to flip, or come close to doing so. Also happened to me. Flipped over the bars while going 6 mph. 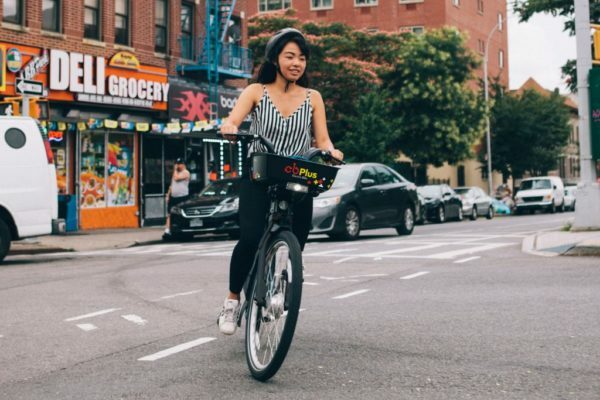 New York City’s bikeshare program “Citibike” also pulled its e-bikes from the streets on Sunday, citing the same braking problem. 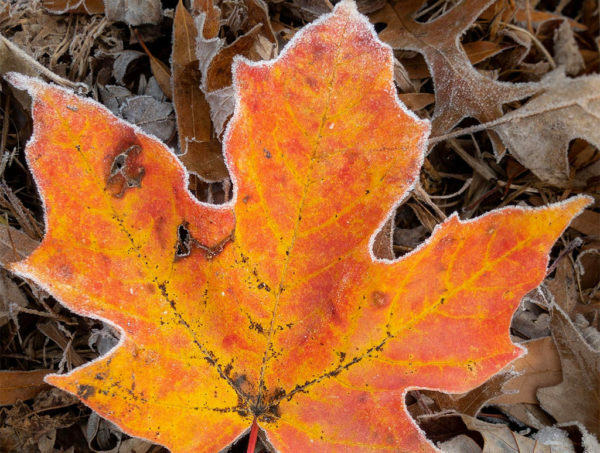 The Arlington Department of Environment Services (DES) shared the news by continuing its repartee on social media with actor William Shatner of Star Trek fame. Previously, the actor sparred with DES over the county banning e-bikes on trails — a policy he called “barbaric.” The e-bike ban was lifted on NOVA park trails last month. 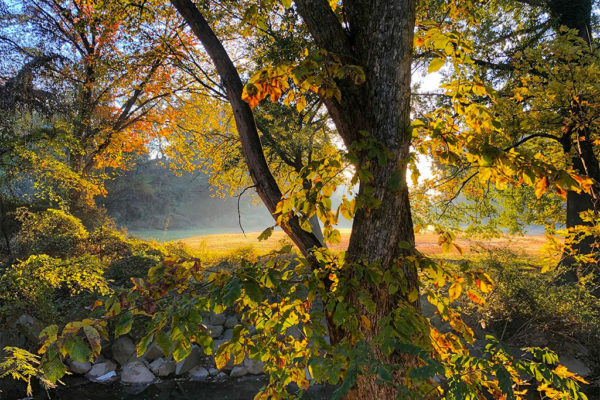 A DES spokesman told ARLnow at the time that officials were also considering lifting it on county trails. CaBi first debuted 80 of the bikes in September as part of a pilot program with the District Department of Transportation. Within two months, data showed that the electric-pedal assist bikes were twice as popular as the normal CaBi bikes, with the e-bikes making up only 2 percent of the total CaBi fleet, but generating 4 percent of total trips, according to data analysis by Greater Greater Washington. 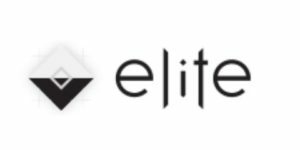 The new recall is not affecting dockless bike providers, such as Lime which added 150 e-bikes to Arlington in December. Rosslyn is set to see a few more pedestrian safety improvement over the course of the next year or so. The neighborhood’s Business Improvement District, which advocates for Rosslyn businesses by collecting a small property tax, is planning a variety of short-term fixes to make the bustling streets a bit safer for walkers. In plans delivered to the County Board Saturday (Feb. 23), the BID says it hopes to use some of its tax revenue to work with county police on the fixes, as part of a broader initiative to make the area more walkable. 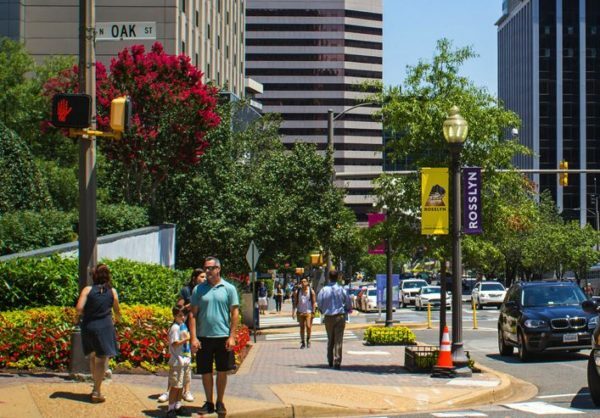 County officials have even contemplated the more drastic step of make certain roads in Rosslyn “car-free,” though they have yet to settle on a precise strategy for the neighborhood beyond some guiding principles. 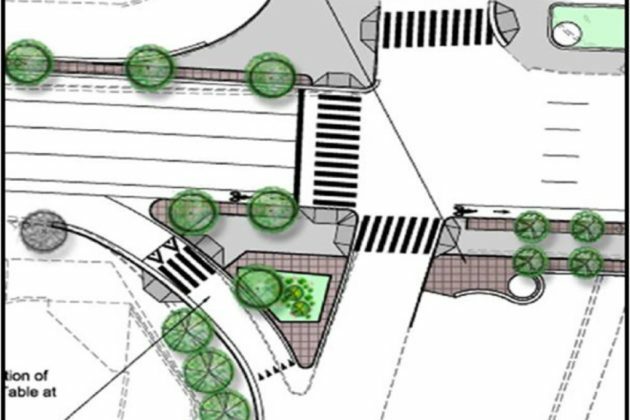 In the short term, the BID plans to build new “crash-grade planters to help delineate safer pedestrian crossings” at several intersections. Many of the roads crossing Wilson Blvd are often the site of robust crowds in the morning and evening rush hours. In the long term, the BID plans to continue to work on efforts to someday convert streets like N. Fort Myer Drive, N. Lynn Street and N. Kent Street into two-way roads, though those changes are still a ways off. Other, more ambitious efforts could someday remove the Fort Myer Drive tunnel under Wilson Blvd, or replace the existing Rosslyn skywalk system in favor of an all-pedestrian and cycling corridor leading up to the area’s Metro station. Some new developments in the area could help spur progress on the latter effort. But all of these changes won’t be on the way until the new fiscal year, according to the BID’s proposal. The group is also asking the Board to hold its tax rate on local businesses level at $.078, though ever-rising real estate values will send the BID an extra $166,000 in revenue from a year ago. E-scooters have been proliferating around Arlington over the past few months, but their growing ubiquity has brought with it some challenges. A new public service announcement from Arlington County seeks to answer some key questions that can improve safety for scooter riders and those around them: Who can ride e-scooters? How can you ride safely? Where do you park after riding? The video is above. The county has also set up its own website for dockless scooter safety and regulation information. Amazon News Roundup — A local think tank argues that “when put in the context of the Metro region’s history, the ‘Amazon effect’ is an unimpressive flare in the region’s chronic housing crisis.” One local urban planner thinks “Amazon choosing a second-tier city could have been more destructive.” Alexandria leaders say Amazon will be an “economic boom, not traffic nightmare.” Finally, there’s more information on the Amazon-fueled deals to build a second entrance to the new Potomac Yard Metro station and open a new Virginia Tech campus in Alexandria. The average warning time for a tornado is 13 minutes. Would you be able to get your family to safety in 13 minutes? Would more time help? The National Weather Service issues weather Watches when the potential for a weather incident exists, but how would you find out? 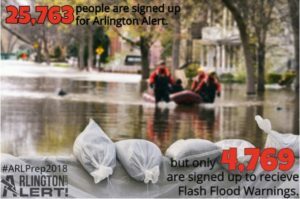 Be informed by signing up for Arlington Alert, the emergency notification system in Arlington County. It’s more than just notifications during major emergencies; you can also choose to receive alerts for weather, traffic closures and severe transit delays. Currently, there are 25,763 people signed up for Arlington Alert; that’s less than 10% of the Arlington County population. Of those people, only 4,769 opted in to receive Flash Flood Warnings. These types of floods happen quickly, and have been happening in our area recently. Would you be ready if that happened right now? By Staying Aware, You Are Better Prepared! 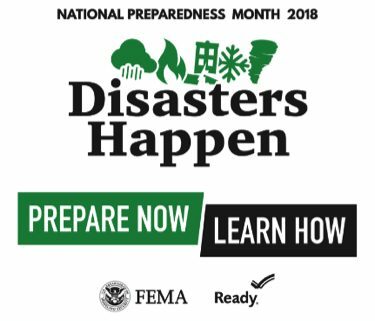 September is National Preparedness Month and we challenge you to do one thing each week to get you and your family prepared. 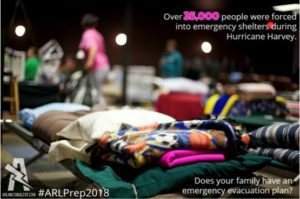 Make an emergency plan and talk to your kids about it. Make sure they know how to contact you or where your meeting location is if there is a fire in your home. Learn first aid or sign up for ‘Until Help Arrives’, our hands-on training with the Arlington County Fire Department that teaches participants how to help until first responders arrive. Get an insurance check-up and set aside funds for an emergency. Disasters don’t plan ahead, but you can. Prepare now! Sign up for emergency notifications at ArlingtonAlert.com and follow us @ReadyArlington on Facebook and Twitter. 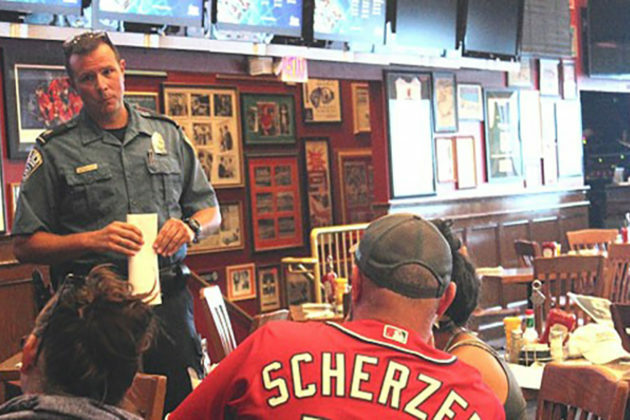 Arlington County police are gearing up for a new traffic safety enforcement push. 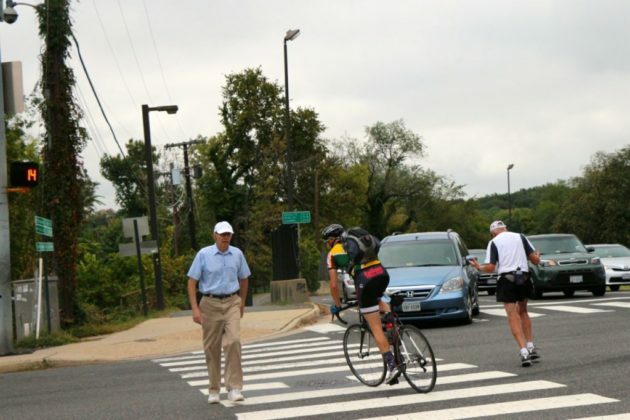 As part of this year’s 2018 Spring Pedestrian & Bicyclist Safety Awareness Program, police officers will be out enforcing traffic laws in Virginia Square and along Columbia Pike this week. 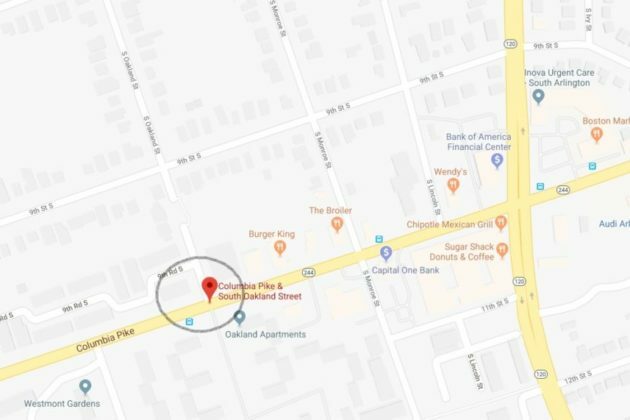 Tomorrow (May 1), officers will be enforcing traffic laws at Fairfax Drive and N. Kenmore Street from 10 a.m.-12 p.m. On Thursday (May 3), officers will conduct the same enforcement at Columbia Pike and S. Oakland Street from 1-2:30 p.m. Anyone spotted violating traffic laws in those areas — motorists, bicyclists and pedestrians alike — will be ticketed. 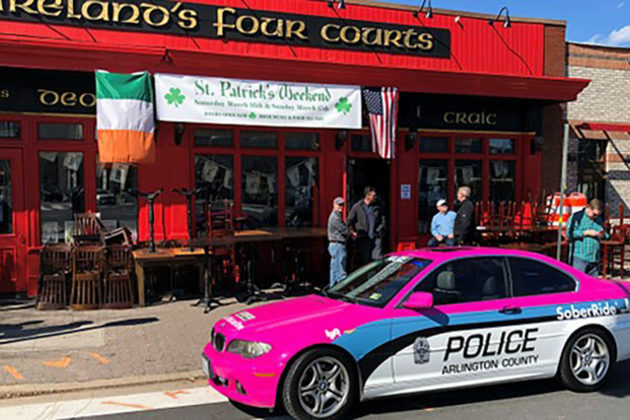 The same campaign in 2016 targeted the Crystal City and Clarendon neighborhoods, and a similar campaign in the fall also took place on Columbia Pike. Each year, pedestrians and bicyclists account for a quarter of the traffic fatalities in the region, nearly 90 deaths per year. The Arlington County Police Department participates in numerous enforcement campaigns throughout the year in support of its commitment to improving transportation safety in the County. These campaigns combine public education and high-visibility enforcement to ensure that all travelers share the road safely. Updated Columbia Pike enforcement timeline at 9:04 a.m. on May 2 due to updated press release sent from the ACPD that morning. 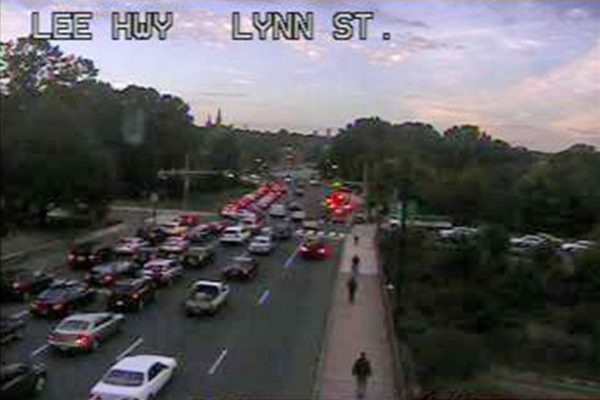 A traffic camera view via Arlington County of the intersection at I-66 and N. Lynn Street. 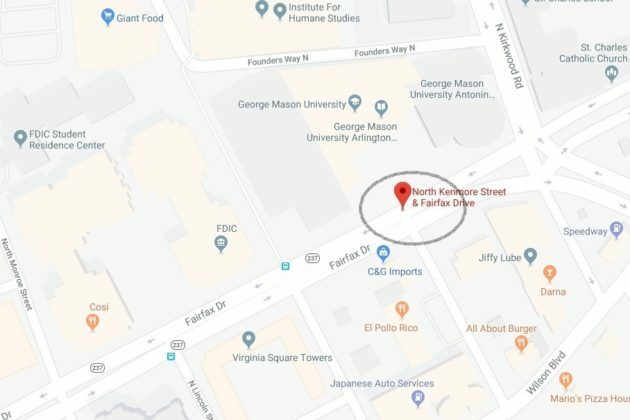 The Arlington County Board approved $1.4 million in additional funding for the N. Lynn Street and Lee Highway esplanade and safety enhancement project. The Virginia Department of Transportation came to county officials with a cost estimate significantly higher than the initial $7.95 million price tag, which was approved by the Board in December 2016. The increase is due to lengthened construction time, increased materials and labor costs since the 2016 estimate and design changes relating to traffic plans, according to the county manager’s report. Initially, the call for construction bids in March 2017 only received one bidder, which was rejected “due to previous established restriction on the bidder by VDOT,” according to the manager’s recommendation. 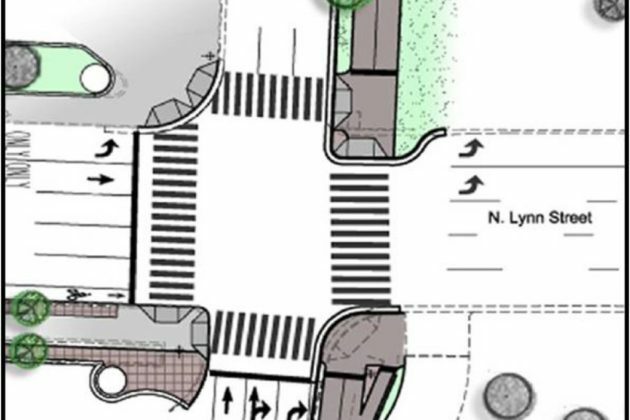 The project will bring pedestrian and bicycle safety improvements, such as wider sidewalks and on-street bike lanes, as well as traffic management and street beautification to the N. Lynn Street and Custis Trail area. A public arts project, the long-delayed Corridor of Light project, will also be installed, but only at the four corners of the I-66 bridge. The Board unanimously approved the increase in budget at its Tuesday meeting. Project construction should wrap up by May 2020. 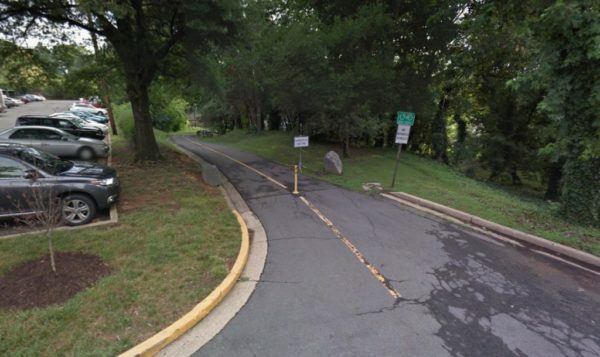 A D.C. taxicab drove onto the Custis Trail yesterday and the incident was caught on video. The taxi was seen driving onto the bike path Monday afternoon near the MOM’s Organic Market on Lee Highway. A passerby saw it happen and ran to make sure the driver, who was apparently lost, was able to safely get off the trail and back onto the road. “I followed him right away to make sure he backs up,” said Wael Salha, who also took the video. Salha says that he frequently uses the path and believes that a narrower trailhead and more car-blocking bollards could have prevented the driver from mistakenly turning onto the path. “I always use that trail and I was really worried,” he said, adding that he’s not trying to get the driver in trouble. A V.I.P. Cab Company phone operator was unable to connect ARLnow.com to the driver with partial plate numbers, but was able to confirm that all cab drivers with V.I.P. are required to use G.P.S. while driving passengers. The operator added that normally the cab company stays within Washington, so the driver was in unfamiliar territory.